Finding the balance between pragmatic and emotional aspects is decisive when designing accessibility products. Products which enable simple, comfortable, convenient and above all flexible use fulfil this requirement. Support rails provide safety and support in all areas of the sanitary room – whether at the washbasin, the WC or in the shower. Easy to grip surfaces and cross-sections that are adapted to the hand enable dynamic gripping and effective force transfer. HEWI support rails enable easy, convenient, comfortable and above all flexible use. The discrete supports and extremely flat roses emphasise the reduced design. A large selection of materials offers numerous design options. A hinged support rail provides support for persons with limited strength and mobility. An ergonomically designed, flat gripping level enables a secure hold. Due to their dimensions the HEWI hinged support rails can be gripped optimally. The front end of the handle can be easily gripped with the hand, making it easy to support yourself on it or pull yourself up with it. The hinged support rail can be complemented with comfort and convenience elements, for example, with an upgrade kit for a toilet roll holder or even an arm pad for particularly pleasant support. The hinged support rails can be folded up against the wall to save space. Fixed support rails (stationary supports) are also available. The Duo hinged support rail has an additional round design bottom rail and therefore enables optimum support for turning in sidewards onto the toilet. 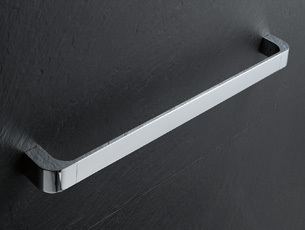 The hinged support rails and support rails are available in high-gloss chrome, satin finish stainless steel, polyamide or as a WARM TOUCH version. 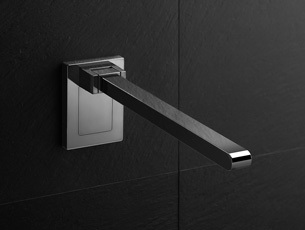 The portfolio has been extended to include hinged support rails which can be used individually and flexibly. If necessary, the portable hinged support rail is simply latched into the permanently installed wall mounting plate. If the hinged support rail is not needed the plate can be concealed with a cover cap matching the surface of the hinged support rail.